There are a lot of major changes between Diablo 2 and Diablo 3, perhaps even more than there were between Diablo 1 and Diablo 2. We’ve examined many of those major issues previously, and discussion of them is what animates our forums. One major aspect of the game that’s changed quite a bit is the monsters. This was to be expected; D3 would be a boring game if everything were the same as D2. There were many changes to the monsters between D1 and D2, and D2 that was made just a few years later, by the same designers. Of course there will be changes to the monsters in Diablo 3, which is being made a decade later, by a new suite of developers. Furthermore, the vastly-improved technology of Diablo 3 allows features and functions unimagined in Diablo 2. Compare the size of Siegebreaker to anything in Diablo 2. I mean anything; he might be bigger than the palace in Lut Gholein, and Siegebreaker isn’t even an Act Boss! Besides the size upgrade, there are certain to be numerous other new monster features we don’t even know about yet. Not everything is new, of course. Many familiar monsters are returning in Diablo 3, though they’ve all been updated, upgraded, and diversified. There are new subtypes of some familiar foes. For example: Fallen Hounds, Skeletal Executioners, and Goatman Shamans, just to name a few. Besides the new monster types, the returning beasties have been upgraded in function and appearance, and one of the more subtle, yet interesting changes, is the subject of this article. Let’s take a closer look at the Diablo 3 Tomb Viper. They act basically the same, and look much the same as well, at first glance. Upon closer inspection though… there’s some weird stuff going on. Click through for pictures, comparisons between D1, D2, and D3, versions and story/plot related speculation. Claw Vipers were introduced in Diablo 1, where they had the same body types, with shorter tails, segments, four arms, swords, a rarely-used charging attack, and a really annoying, projectile-dodging movement style that almost always had them attack your character from a diagonal angle. They were one of the nastier of the melee enemies found in the Hell levels, since they hit very quickly and zigged around so much as they advanced. There wasn’t anything mysterious about them, though. 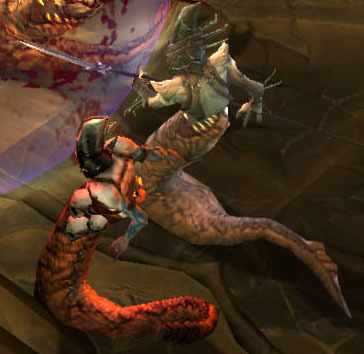 The Claw Viper monster type returns in Diablo 3, though none of the subtypes yet known have that actual name. Their official game title appears to be Tomb Viper, and the two types thus far seen in game are called Tomb Viper and Serpent Magus. I believe that the Tomb Viper is the brighter orange one, while the Serpent Magus are a darker salmon color and more importantly, are armed with tridents. There will likely be other subtypes, varying in coloration and weaponry, and who knows, perhaps even some spell-caster types, or ones possessed of other elemental attacks. That’s pure speculation, though. What we do know is that the monster type has been upgraded from D2, in some fairly odd ways. Most obviously, they’ve discovered itamz. Both types of viper now wear helms, and the Serpent Magus all seem to wield two-pronged spears. As for their bodies, that’s where the real mystery comes in. I first conceived of this article just based on how weird the Tomb Vipers bodies looked in the screenshots, since it really seems like they are human men whose lower halves have been swallowed by crocodile-toothed snakes. Wut? Exactly. Look closely. It’s a snake, with its mouth open and swallowing a guy. Or a guy standing inside a snake’s throat. You do not notice this in the game, when they are tiny and fast-moving, but when staring carefully at a screenshot (something some of us do a bit too much of) you can’t help but notice it. It’s almost like a guy standing inside a huge, custom-painted sock. Snakeskin overalls? If you can’t quite make it out, the picture below should help get across the general concept. As well as give you a great idea for what to dress your dog as next Halloween. So um… yeah. What are the D3 Tomb Vipers, then? Are they some weird symbiotic fusion of man and snake? Men who are somehow living on while their lower halves are slowly digested by giant serpents? Snakes who bit off more than they can chew, and have been magically mutated into something like a snake-taur? It might relate to the game’s plot, of which very little is known. We do know that twenty years have passed since the events of Diablo 2, and that Sanctuary is generally decaying and beginning to run down. Everything is become corrupted and fouled, as evidenced by the shrines in Diablo 3, which are all called “corrupted shrines” before you click upon them. We’ve also seen the crazed human followers of Diablo, and their self-mutilation with huge nails, as well as voluntary possession by demons. Given those oddities, is it out of the question that men might be experimenting with dark magics and mutating themselves by combining their bodies with those of animals? The man/snake fusion was my best guess, until Bashiok released that photo of the Brom painting earlier this year. 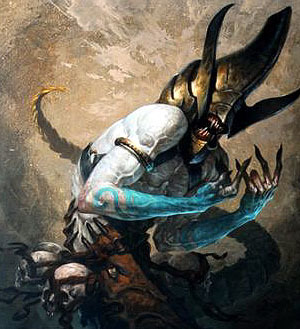 The original artwork, which hangs in the newly-renovated Blizzard Art Museum on their Irvine campus, gives us the first non-screenshot look at the Tomb Viper. Bashiok let me know that Brom did the painting after viewing the game art (it is not concept art; it’s based on the completed creature, created by the D3 Team), makes the lower half of the man look more like a costume than the business end of a legless reptile. A costume that’s been nailed or stitched to the man, but still a costume, rather than a living creature. We don’t know how authoritative Brom’s is, since it’s not exactly game art. No concept art for the D3 Tomb Viper has been revealed, and Brom might have based his version on some concept art he saw, or screenshots, or animation demos, or huge, blown-up in-game art. Or all of the above. And he certainly took some creative liberties, giving the creature his own (awesome) interpretation. Which means… that we don’t really know what’s going on with the Diablo 3 Tomb Vipers. Are they snake-men creatures with a weird waistline? Men being eaten by serpents? Men somehow fused to snakes? Or just a cool looking monster created by the D3 artists without any definitive game fiction to explain its form and function? It is, however, most worthy of closer inspection.